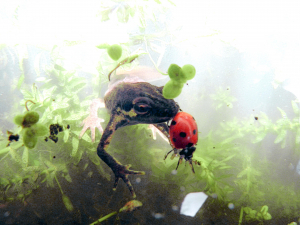 One day, as i was pond watching in my usual position (lying on my belly with my face a few centimetres from the surface), a Ladybird suddenly blundered into the water. Over the next 15 minutes, the struggling commotion it made attracted several surfacing Smooth and Palmate Newts. Each in turn excitedly darting and grappling with the bug for a time before losing interest and gliding away - the Ladybird's toxic defence presumably proving very effective. The surface glare, a cheap camera and lack of skill worked equally effectively at denying me a decent document of the drama! Nevertheless, hope this is an observation of interest. The above shots are the best ones i managed and show a female Smooth Newt (note spotted throat) and - i think - a Seven Spot Ladybird. Of course the species interaction would be more accurately described as "attempting to eat", but that option wasn't available.